One of the popular professional Athletic and exuberant sports personality, Randy Gene Moss simply known as “Randy Moss” is a former football wide receiver. He is well known American celebrity. He is famous for contribution to professional life. Randy Moss is best known in the sports world for playing 14 seasons in National Football League (NFL). He is very talented and skilled player. Passionate and enthusiastic former football wide receiver, Randy Moss was born on 13th February 1977 in Rand, West Virginia, United States of America. Randy carries an American nationality. His star sign is Aquarius and belongs to a black ethnical background. He is the son of Randy Pratt and Maxine Moss, his parents. 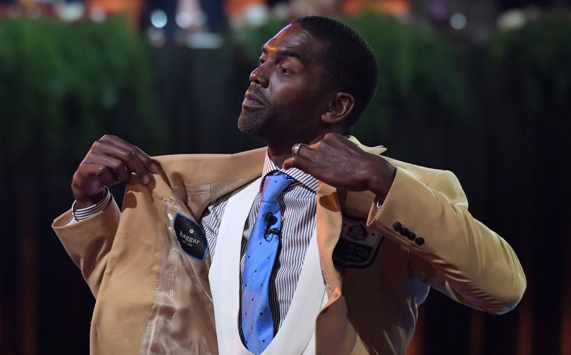 As far as his education is concerned, Randy Moss completed a high school education from ‘DuPont High School’. After completion of high school, he got enrolled at Marshall University from where he earned his University degree. At the small age, he began his career with football. Randy has got a great personality. Talking about his body, his height is 1.93 m. His weight is of 95 Kg. His eye color is dark brown and the hair color is black. He has a balanced body with good health. He has an attractive body figure. His smiling face and charming personality have helped him to gain the attention of all the viewers. Randy Moss was active in sports while studying in high school and college. When he was studying at DuPont High School, he got a chance to excel his sports skill. Randy Moss high-class sports skill led DuPont to gain victory in back to back state championships. Randy was a star in the high school. He continued to play football even he finished high school. Initially, he had a dream to play for ‘Notre Dame Fighting Irish’. In the year 1995, he started playing as a freshman. After a year in 1996, Randy set the records of most games with a touchdown catch in 14th season in NCAA Division I-AA. While playing for Marshall University, Randy achieved his third career 200 pus yard playing against Kent State. Moss had an unbelievable record playing for Marshall. He had scored at least 1 touchdown in all twenty-eight game he played for Marshall. In fact, he was awarded "Fred Biletnikoff Award" as nation’s leading wide receiver. Randy Moss started his professional career in 1998 NFL Draft. After playing in NFL Draft, he was signed for a four-year contract with Minnesota Vikings. In the initial season of 1998 playing for Vikings, he was ranked number one offense scoring NFL record of 556 points. Randy has earned success in almost all seasons he played for Vikings. 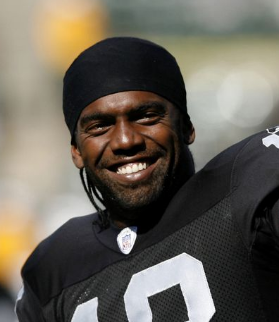 Randy Moss was traded to ‘Oakland Raiders’ on 2nd March 2005. However, he was not happy about being in Oakland. On 14th November 2006, he was honored as the kick returner. After ending career journey with Oakland, Moss started new journey playing for New England Patriots. For Patriots, he played in Super Bowl XLVII, 2008, 2009 and 2010 season. Randy returned to Vikings after two days he played against Miami. Randy’s agent Joel Segal announced that he is going to retire on 1st August 2011. However, after a year of that on 13th February 2012, he announced he is making his comeback soon. On 12th March 2012, he signed a 1-year contract with ‘San Francisco 49ers’. Currently, he has officially announced his retirement. Randy Moss has set many records and achieved many honors and awards in his career. His brilliant playing skill and passion towards football have always admired other people to make a career in sports. Moss is a first-ballot Hall of Famer. Throwing some lights toward his personal life, Randy Moss is currently dating Libby Offcut. He has been in live in relation with girlfriend Libby Offcut from a long time. Randy has four children from getting into love relation with longtime girlfriend Libby Offcut. He has two daughters named Sydney, Senali and two sons named Thaddeus and Montego. Randy is still in a good relationship with Libby. The couple makes public appearances together often. There is no any sign of Separation between them. They are living peacefully. Prior to getting into relation with Libby, he was rumored to be in a relation with Rachelle Washington. This excellent player makes good money from his work. The net worth of Randy is estimated to have $25 million as of 2018. His salary is kept in privacy but there is no doubt in the mind of his supporters and followers he is satisfied with his earning.